in the blood of some people there. If you want to see an environmentalist kinda lose his cool – talk to James Clift of the Michigan Environmental Council. And bring up dioxin pollution. Clift is frustrated with people who could have wrapped this up. When I talked to federal and state officials about this, they did some serious finger-pointing. Let’s start with Steve Chester. He heads Michigan’s Department of Environmental Quality. Chester says when people first learned about the dioxin problem at Dow’s chemical plant, the federal government was the lead regulator. Actually, it took Michigan almost ten years to re-license the Dow chemical plant. That meant the state was slow to find out exactly where old dioxin pollution was in the river system, so some people didn’t know there was dioxin in their yards until the past few years. That’s decades after dioxins got into local rivers. But what about the US Environmental Protection Agency? Several former officials said the polluter, Dow, slowed things down. One of these who would go on the record is Mary Gade. She led the EPA office that regulated Dow. Now, in the past we’ve reported Gade said she was fired by the Bush Administration because she got tough with Dow. The EPA wouldn’t comment on that. But even today, Gade says Dow slowed down the clean-up. A confidential memo leaked from the EPA says when Dow didn’t like what Michigan’s technical staff had to say, they’d go higher up and try to get rules changed. For a month, I requested comment from Dow. A spokeswoman said the company is interested in talking about the future, not the past. People who’ve watched this say, there’s been plenty of foot-dragging. But why should this dioxin cleanup even matter to people who don’t live there? It’s Michigan’s problem, right? Well, James Clift, that environmentalist, says, no, there’s a long list of toxic waste sites across the country. And Clift worries the government gets bogged down with big, slow cleanups. But there seems to be some progress. 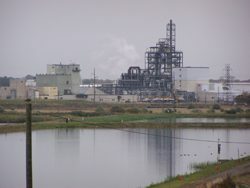 Recently, the EPA, the State of Michigan, and Dow came to a tentative agreement about cleaning up the dioxin pollution. That means there’s at least one more delay, that would be public comment until mid-December. That’s one delay many people don’t mind.